When you have a broken padlock, sure what it is locked on might be secure, but the lock is only as useful as a weld. If you need access to whatever your broken padlock is securing, you need to know how to open a broken padlock. Throughout the history of padlocks, people have had to deal with what happens when a padlock breaks and won’t open. But never before has history seen a blog post so comprehensively delve into how to remove a broken padlock. How is the padlock broken? A broken padlock is not always going to be straightforward. A locking pawl that is jammed could easily be confused with a lock core that has broken. Knowing the difference between those two types of broken padlocks is integral to finding your solution unless you are content with using destructive entry. If you are fine with destroying the lock in the process of removing your broken padlock, you can open a broken padlock without understanding what is wrong. And in cases where something has truly broken, you might have to use destructive entry anyway. It is only when jamming is caused by clogging, rust, or something that creates a temporarily broken padlock. But even if the lock has truly broken in some way, it may still be salvageable if you can circumvent the damaged component. Then you may be able to replace the single part, so how to open the broken padlock should not break more than needs to be broken. Look into what you can do, and that trying multiple methods (especially 1 and 2) before committing to anything destructive. Although you might not be able to permanently fix a lock when you are just looking for how to remove a broken padlock, you might be able to get it to a certain level of functionality. For example, the keyway of a padlock can become clogged. It might not be as easy to clean out as it would be to remove a broken key from a lock, but if a vandal has shoved sticks or sprayed foam you can still pick out what is blocking your key. Other times, jamming that is due to wear or a natural accumulation of rust or gunk can be overcome for the purpose of removal with some lubricant. Lubrication can allow the materials that are catching on one another to slide past each other, perhaps only temporarily. You might be able to clean the lock well enough to safely use it again without fear of dealing with a broken padlock again, but that is not currently the concern. What you should be worried about is only how to open a broken padlock. Beyond lubrication and cleaning the lock there is going to be very little that will fix the broken padlock. With a padlock broken to the point where basic cleaning (even if cleaning is extensive enough to take quite a bit of time) does not work to get it to the point where it can be removed, you should most likely move on to a different broken padlock removal method. To shim a padlock, the padlock has to utilize a particular type of locking pawls. You cannot shim a padlock that has ball bearings, but with the locking pawls that you would find on the products of less than adequate security manufactures, this is very possible. To know if your padlock can be shimmed, you can either look up the details of your particular lock online or in any type of documentation you can get your hands on, or see if you can find/remember how the shackle looks. If the shackle has cuts that look like little crescent moons that dimple in (very curved and smooth), then you will know the padlock uses ball bearings. The type of cut you want to see is a is squared off or having an almost fish hook shape. That shape corresponds to a locking pawl that can be depressed by a shim. Slip your tool into the gap between the shackle and lock body. If you are using two shims, insert them in a way that keeps the gap for insertion large enough. Insert the first shim into the side of the padlock with the tightest gap. The side with the wider gap will likely diminish, but still be wide enough for the second tool. Press down on the shim(s). If you are using two shims, press down the shim with the tighter gap first. The lock will open if the reason for your broken padlock does not have to do with the seizing of the locking pawls. Using a shim is as simple as that. You may need two shims (one for each end of the shackle) depending on your lock and what you know about it. If you use two shims on a padlock that can be shimmed, unless the padlock is broken to too severe of a degree, you will be able to open and remove the lock. Any padlock can be cut. It does not matter if you have the best padlock ever made, or even the strongest lock that could even theoretically exist, with the right tool and enough time, you can remove any broken padlock by cutting it. 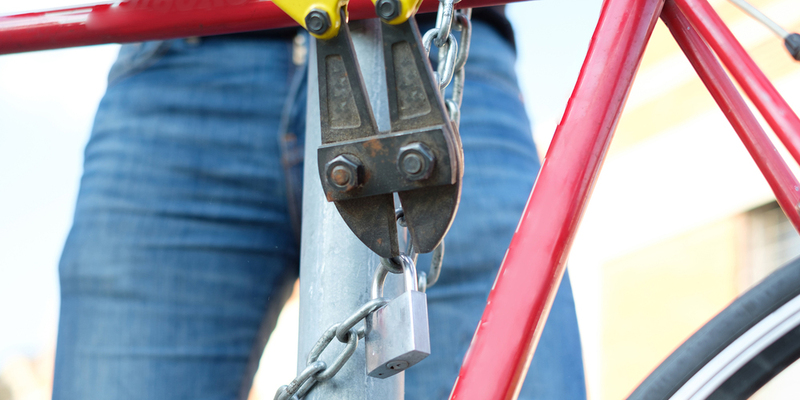 Most padlocks can be removed with a pair of bolt cutters. The stronger the lock, the larger the bolt cutters will need to be (the larger the bolt cutters, the more PSI can be applied with less strain on the user). You can also invest in harder blades for whichever bolt cutters you have. From there, you get into power tools such as angle grinders, die cutters, etc. If the power of these tools is still not enough (which is very unlikely), you can buy stronger blades. If you have a very well composed padlock, even a tool like this might take you a fair bit of time to remove the broken lock. The best part of the lock to cut is the shackle. It will be thinner than the lock body, though a padlock with a shroud on a chain might leave very little of the shackle exposed. Also, if the shackle is a dual release (meaning the shackle must release on both sides), you will have to make two successful cuts as if you were cutting a link in a chain. Speaking of how you would cut a link in a chain, if you are looking for how to open a broken padlock, you might be overlooking the fact that you don’t have to open the broken padlock. With a padlock broken, you can still remove it by cutting what it is attached to a hasp, chain, door knob, etc. Another form of destructive entry is to drill out the lock core. Though this method could potentially leave you with a lock that could still be used. This would only be the case if the broken padlock had a removable core, and if the drilling was done expertly enough as to not harm the lock body. Harmless drilling can be hard to pull off and drilling a lock is often the last choice for a locksmith, so temper your expectations about your possibility of keeping your lock after this process. It is more unlikely to leave your lock in working order if you have never drilled a lock before, or if your lock has anti-drill pins or anti-drill plates. In terms of how you should drill your lock core, try to drill out the shear line. If you do not know what the shear line is, you can learn more about the parts of a lock in this article about lock picking. This method is ideal when the core has worn out so that your key won’t work. In more extreme cases, you might need to drill out the core entirely. This would be for instances where you have a padlock broken in a way that keeps locking pawls static no matter how anything is manipulated. With the core fully removed, the internals of the lock can pour out. When everything comes tumbling out of the lock, nothing will be there to keep the shackle locked. If you do not want to or feel as though you cannot do this work yourself, you can always call a locksmith. The only thing that you have to make sure to do is vet your technician so that you get the right locksmith. Essentially, a commercial locksmith is very likely to deal with these issues in cases of warehouses, plants, construction sites, etc. But residential locksmiths might also have the tools and experience to help you. You do not need to choose the locksmith you call based on your situation, but rather the service that you need. For example, you might need to remove a padlock someone was using to secure their gym locker, and think that a residential locksmith would not be appropriate as you are the gym manager. But a mostly residential locksmith might deal with padlocks that have been left on gates for neglected perimeter security and be uniquely qualified to deal with broken padlock removal. If you are worried about how much this service will cost, you can set your mind at ease about locksmith prices. The main thing that you are paying for is their knowledge and their ability to complete the job to an extent that you might not even recognize as necessary. However, you might want to be aware of the costs of an emergency 24/7 locksmith, as this issue could crop up at irregular business hours. In terms of your ability to pick a lock for the purposes of removing a broken padlock, it is unlikely that picking is going to be any kind of solution. More than your lock not being able to be picked, the bigger issue is that you have a broken padlock. It is not going to open with the key, and it is not going to work by trying to simulate the key either. If you use specific tools for a bypass, this is truly the only way that you can pick the lock. This is lock picking in a more technical sense than the generally understood sense of the term. However, it is very tricky to know what tools you can use and the methods that you can use to open your particular padlock. Getting this type of information can be difficult if you have a strange lock, but if you have a lock that has a widely publicized as having an easily exploitable weakness, you might be able to “pick the lock”. This type of lock picking is done by ignoring the standard functionality of the padlock and manipulating the internal locking components (shimming is a specific example of this). It is important to replace the broken padlock that you have removed. Do not decrease your level of security when you change locks (ie. Do not replace your locks with a worse lock). 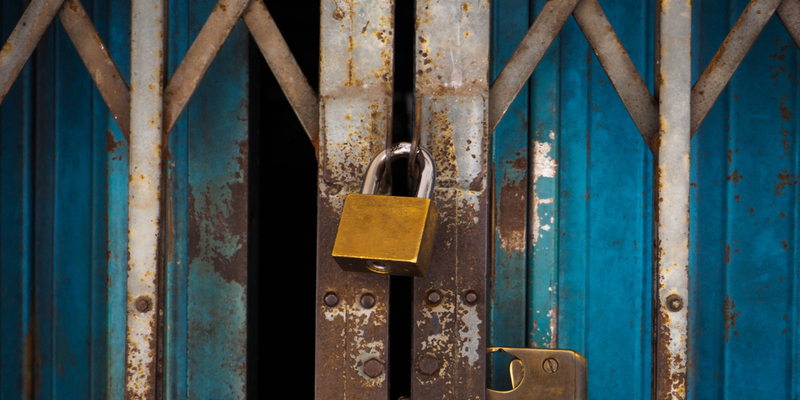 Follow the basic rules of evaluating the cost vs security of your new lock. Take care not to damage anything more than what is needed to replace the lock. Follow basic safety protocols while using cutting tools. If you are worried that you will cause undue harm to yourself or your property, contact a locksmith. This information is not intended to assist the unlawful removal of working padlocks. The processes shared in this article are to be used solely to understand how to open a broken padlock that you own or have been given permission by the owner to open. If you are not looking to open a broken padlock, but rather one you have lost your key or combination to, take a look at the best ways to open a bike lock. Best of luck removing your broken padlock and getting your security back in working order.